While this personnel is facing a dilemma, you may discard a card from hand to make him lose a skill until the end of that dilemma. You may do this only once each dilemma. "Makes you pine for the good old dull days in New Berlin, doesn't it?" Characteristics: lose skills until the end of the dilemma, affiliation, Deep Space None related, Maquis related, discard a card from hand, Human species. Card logging info: First edited by Telak at Jul 28th, 2018. Please support openCards and validate game text of this card! On November 24, 2004, Decipher announced the results of the Reflections Contest #2: Chaotic Quotes. This contest required participants to match bits of lore and images for (at the time) unrevealed cards. Back then I knew only a little about Trek (I came to the franchise through the game, not the other way around), but I knew how to Google phrases to find their respective episodes. Out of 49 correct entries, mine was randomly selected as the winner. My prize of a display box of Reflections arrived at my door in far less than the 8-10 week estimate. At this point in time, I had only played Star Trek for about seven or eight months. I had a part time job, and much of my pay went towards college expenses. I could scarcely afford more than a few packs at a time, so you can imagine my excitement at opening a whole box! Even better, Reflections packs contained cards from all the previous expansions! My small and terribly incomplete collection received a sudden influx of 432 cards. From these cards I built my first truly viable decks. When I sorted through the cards, one grabbed my attention above all others. Confessions in the Pale Moonlight would allow my personnel to gain whatever skills I needed to meet dilemma and mission requirements. I kept forgetting to execute the order on Benjamin Sisko, Man of Resolve , but Julian Bashir, "Unnatural Freak" could gain Treachery in a pinch. Jadzia Dax, Problem Solver and Sarina Douglas, Cataleptic Conundrum to kept pulling Confessions in the Pale Moonlight to the top of the deck. Every once in a while I even got the Maquis in on the fun as at that time Michael Eddington, Traitor to Starfleet could play to Athos IV, Maquis Base . Over time players switched to dilemmas which do not require skills, like Agonizing Encounter , or even which punish you for having a surplus of skill, like An Issue of Trust. Meanwhile we waited over four years for William Ross, "Temporary" Ally , the next personnel with a built-in way to gain Treachery. Confessions in the Pale Moonlight fell by the wayside, but it will always hold a special place in my heart. For that reason, so does today’s spoiler: Cal Hudson (Nostalgic Rebel). By the time Benjamin Sisko welcomed Cal Hudson to Deep Space 9 in The Maquis, Part I, the nostalgic rebel was already secretly working for the Maquis. This version of Cal Hudson represents his double life by giving him both the icon and the icon. His ability to hide his true nature comes through in his ability to lose one of his skills. When faced with a Personal Duty , Cal Hudson can take off his pips and pretend he does not have the Officer skill, much like a built-in Stricken Dumb . Cal Hudson provides a useful personnel for the Maquis, but I find him more interesting in a Deep Space 9 deck. The following deck uses Confessions in the Pale Moonlight and easy 30 point missions. You can complete three missions and score extra points with Debate Over Dinner and Reliving the Past , or you can complete all four missions and use the extra points for Krim, Thoughtful Tactician and Melora Pazlar, Independent Personality . The deck does not require any particular dilemma pile, though you might consider Consume dilemmas in case you do not need Debate Over Dinner on your own missions. 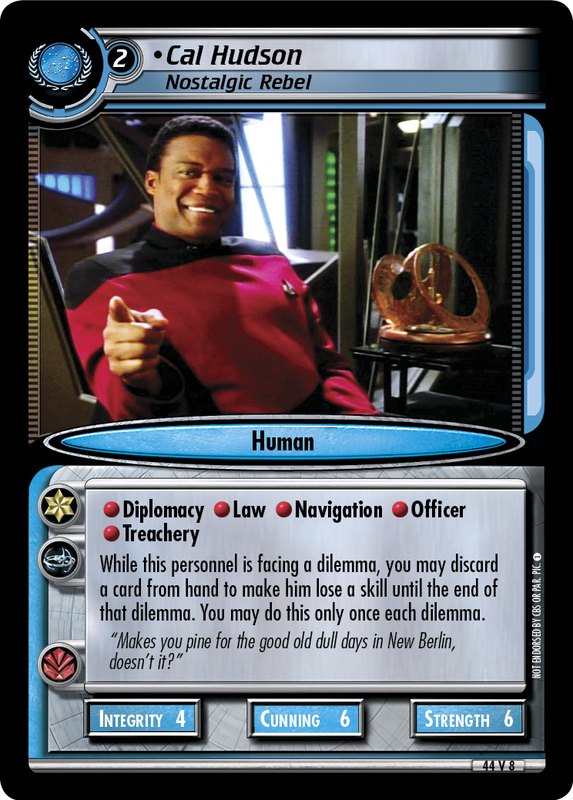 I hope you enjoy this Deep Space 9 deck, but you may want to keep your eyes open for him to make a cameo appearance in an upcoming article. See correponding Deck "Rebel With a Cause" here.